The world is developing toward a new era, the era of transition from almost dependence on fossil fuels to the wider use of alternative energy sources and renewable energy as a solution for the problem of energy supply which accompanies with population growth and development of technologies. Different sources of biomass, as affordable and renewable non-fossil sources, include different animal organic waste, agricultural, municipal, and industrial wastes. In this regard, anaerobic digestion (AD) of agricultural residues and other biodegradable wastes is being widely used as the best treatment option with a potential to extract about 70–50% methane (CH4) and 40–30% carbon dioxide (CO2), and both are suitable for the production of renewable energy including biogas, recycling organic materials, and pollution control. Use of organic and chemical additives under different operating conditions may play an important role in improving the degradation of biological reactors and it may increase biogas production. The types of pre-processing methods including reducing the physical size, thermal hydrolysis, ultrasound waves, pretreatment chemicals including ozone treating, using different alkaline or acidic materials such as acetic acid and nitric acid that to remove the most parts of the ingredient containing lignin, to have more access to cellulose and to improve its changing to methane gas in AD process. The performance of acetic acid and nitric acid utilization with an amount of 80% may lead to remove lignin (a result of losing weight by about 40%) and will improve the efficiency of methane by increasing the biological degradation of organic compounds. Furthermore, in the biogas technology, we can increase the efficiency of digestion by utilizing raw materials and various nutrients which any of them may be from a rich material to ensure the proper ratio of carbon-to-nitrogen (C:N) from the digestion of the wastes containing high carbon and cellulose contents such as vegetable wastes and other agricultural wastes with alkaline compounds and ammonia rich such as manures which put at the disposal of anaerobic microorganisms. Therefore, the biological conversion of agricultural wastes such as fruit and vegetable plays an important role in meeting the today’s growing needs to energy. Pomegranate, a national and economical fruit, is one of the most important vegetable products in Iran which has many applications and is wildly used in changeable industries. Thousands of tons of pomegranate wastes (mainly peel) are produced in the area each year by extraction plants, pomegranate juice processing, and concentrate as unusable by-products that are mostly used for livestock consumption the most major parts that are not used for the mentioned used Are dry waste useless for livestock that the problem of storing them is considered as something useless and even for the factories in great numbers. The use of these wastes could facilitate AD so that we can prevent environmental issues by collecting and supply them as raw materials for the production of biomethane fuel gas from one side and reduce the issues of wastes management, on the other side. But due to an imbalance of nutrients (effective carbon-to-nitrogen ratio) for microorganisms and lack of basic average capacity for the chemical reactions that occur in the waste organic material, it cannot be used alone and effectively; this issue can often be overcome by mixing the waste simultaneously with cow manure. In this study, poultry manure was used because of its high buffering capacity and nitrogen surplus which can support the extra carbon from the wastes containing high carbon to achieve the proper pH with ammonia production, inhibiting the activity of volatile fatty acids (VFA) and the growth of methanogens. Hence, by ensuring the proper ratio of carbon-to-nitrogen, fixed pH, and nutrient balance resulting from the simultaneous digestion of the substrate, methane production investigation during the anaerobic fermentation is important. Cow manure, as inoculum and source of microorganism surplus, was used to improve the reactor. In reference to the above contents, the main objectives of this study were: (1) investigation of the effects of pomegranate peel, poultry manure, and cow sludge manure digestion to produce biogas, (2) the mixing ratio of these materials, (3) determination of the optimum ratio of AD of pomegranate peel, poultry manure and cow manure, and (4) and the effects of functional parameters on the best ratio in a discontinuous manner. The pomegranate peels used in this study were collected from a pomegranate extract plant. The poultry wastes and cow manure were prepared from the research farm of the Islamic Azad University, Khorasgan (Isfahan). The poultry wastes were passed through a 36-mesh sieve and were collected in sterile plastic bags and transported to the laboratory. The prepared materials were stored at 4°C. The produced cow manures were transferred to the laboratory using 20-l plastic containers. 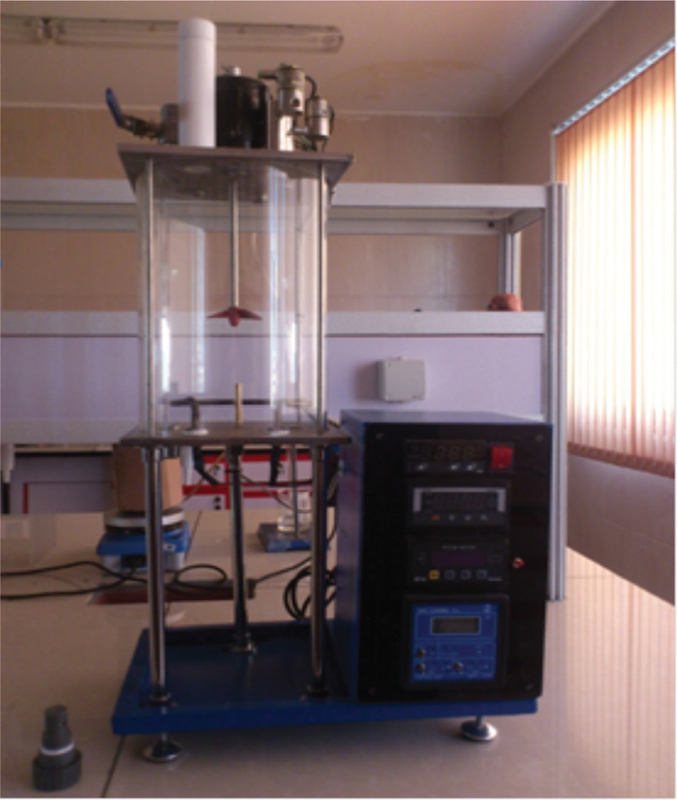 The ratio of carbon-to-nitrogen (C:N) of the pomegranate peel, poultry manure and cow sludge manure was measured. The C:N values for each of the material were 80, 1.51, and 22.7, respectively, which were outside of the recommended optimal range (i.e., 20–30). In this study, the physical and thermal–chemical pre-processing was used for the pomegranate peels. The physical pre-processing includes crushing pomegranate peels in size of 0.5–1 cm, and the thermo-chemical pre-treatment was performed by boiling pomegranate peels in a solution containing acetic acid with a concentration of 35% and nitric acid with a concentration of 2% for half an hour to decompose cellulose tissues. The samples were then placed in pre-prepared filters and were washed using distilled water until the full neutralization. The optimal dose of acetic acid and nitric acid was selected according to a pilot study that was specifically set up to achieve maximum methane degradation. The use of acetic acid and nitric acid in the pre-treatment of newsprint in about 80% led to remove lignin and improved the performance of AD process. This experiment was first performed using 1 l anaerobic digesters in a laboratory scale. Since the biogas production process was done in an anaerobic condition, the digesters were covered by plastic stoppers and aluminum caps, and a glass tube was placed in a container filled with water to collect the gas flow. The gas volume was recorded by measuring the amount of the evacuated water. To determine the effects of different ratios, the simultaneous digestion of pomegranate peel mixed with poultry manure and cow manure sludge in a batch fermentation method was used. The volume of spilled materials in each digester was 800 ml which contained the appropriate mass ratio of pomegranate peel, poultry manure, and cow manure sludge as inoculum. To obtain the best mixing ratio of pomegranate peel digestion with poultry and cow manures, these three materials were mixed in four different mass ratios. The first treatment (T1) included 60, 13, and 27%, the second treatment (T2) consisted of 89, 0, and 11%, the third treatment (T3) contained 28, 28, and 44%, and the fourth treatment included 0, 34, and 66% pomegranate peel, poultry and cow manures, respectively (cumulative of values of 100). Furthermore, the C:N ratio of about 25 (the optimum ratio) and concentration of total solids (TS) equal to 7% were considered for all treatments. The digesters were tested under thermophilic temperature conditions (55°C) within 15 days. Ordinary water was added to the digesters to keep the total solid contents equal to 7%. Sodium bicarbonate was used as the alkaline for the adjustment of optimum pH of the digester (neutral range). Daily stirring for about 5 min was done for all reactors. Each treatment was set up in a discontinuous manner with three replications in 18 reactors and steam baths to investigate the effects of combination of different materials on the biogas production [Figure 1]. Measurement of TS, volatile solids (VS) and acidity of the materials was investigated at the beginning and end of the digestion process. The biogas volume was measured daily. Finally, the best treatment to enter the reactor with a volume of 9 l (second period) was determined based on the analysis of the measured data to measure functional parameters. The second step of the digestion process of the best treatment period was established in a 15-day experiment with thermophilic temperature (55°C). The sampling intervals were determined based on the slope of the biogas production in every 3 days. The amount of produced biogas from each digester was recorded during the digestion process in every day using water displacement. Water bath was used to maintain the temperature of the batch digester. The applicable parameters were included the measurements of pH, total carbon, total nitrogen, VS, and TS. To measure the amount of nitrogen, the Kjeldahl method was used. An oven (Memmert Model Enterprise, Schutzart, Germany) was used to obtain the dry weight. To determine the amount of carbon contents of the samples, the furnace (made by Aria electric that is an Iranian company) was used. For measuring and adjusting the pH of microbial mixture, an acid meter (pH 162 constructed by the Iranian Equipment Technology Co.) was used. The amount volatile solid is a criterion which is used to measure the amount of organic materials in each sample. The produced biogas from lignocellulosic materials usually expressed in unit of VS. The TS and VS were measured using standard methods for water and wastewater. To analyze the results, the variance analysis technique was used. For determining the optimum conditions for the production of biogas (optimization 1) with regard to the different material ratios and their interactions, the least significant difference test at P < 0.01 was used. The statistical analysis and graphs were performed using the SAS (Statistical Analysis System) software and excel, respectively. As [Figure 2] specifies, the simultaneous discontinuous digestion with pomegranate peel, poultry manure, and cow sludge manure for all mixing ratios can be divided into four periods according to the Li et al. study in which different proportions of cow manure with rice, corn, and wheat straws have been used for the biogas production. 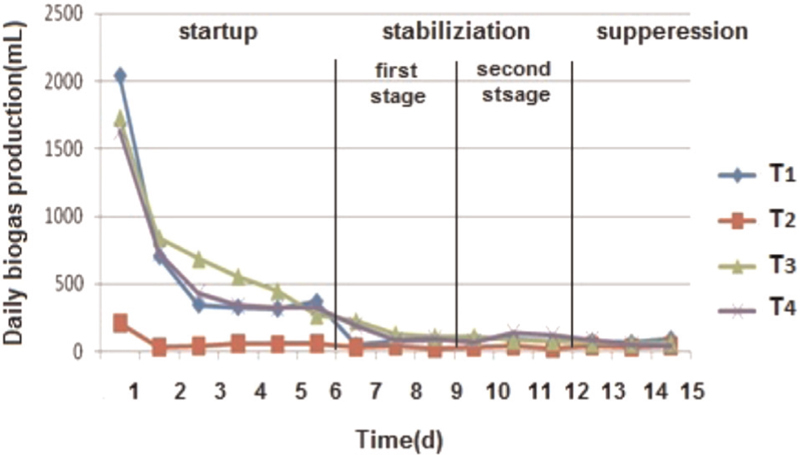 The processes were named according to the results of this study including: the setting up period (the first day to sixth), the stabilization phase (the sixth day to the ninth day of the first part of the stabilization step and the ninth to the twelfth day of the second part of the stabilization period), and the suppression period (day of the twelfth to the fifteenth). The biogas productions increased rapidly in the setting up phase (the first day to sixth) and were measured in about 618 ml/d for the T1, 72 ml/d for the T2, 826 ml/d for the T3 and 627.5 ml/d for the T4. With starting the first phase of the consolidation period (sixth to the ninth day of the experiment), the AD process for producing biogas from the simultaneous discontinuous digestion was constant in all investigated treatments so that the lowest production was related to the T2 treatment with 60 ml, and the highest values belonged to the T3 and T4 treatments with 248 and 226 ml during the stabilization period, respectively. The experiment showed a downward trend with very low amount of biogas production in the last 3 days of the experimental period (suppression) with about 82, 36, 62, and 57 ml for the T1, T2, T3, and T4 treatments, respectively. In fact, the third treatment (T3) with a ratio of 28, 28, and 44% had an appropriate combination of pre-processed pomegranate peel, poultry manure and cow sludge manure and produced the highest cumulative biogas with an amount of 5885 ml among the four investigated treatments [Table 1]. The biogas production in this treatment had significant differences with the second treatment (T2). The intense microbial activities and the fast decomposition reaction of the raw materials in the T3 during the early stages of the process might be due to high amount of pre-processed pomegranate peel. Furthermore, the nutrient balance (C:N) for micro-organisms and providing an average alkali capacity for chemical reactions and avoiding the accumulation of VFA will cause improvement in digesting a proper amount of substrate. Liew et al. reported that unprocessed wheat straw has further lignin which may lead to a more rigid structure and thus bacterial abilities for the decomposition of these lignocellulosic materials will be restricted. Therefore, the high amount of pre-processed pomegranate peels in this treatment as compared to other treatments have increased the biogas production performance. But the thing is digesting the cow sludge manure alone (second treatment) may contain varying amount of ammonia which halted the methane formation stage. In the second treatment with admixture ratio of 89, 0, and 11% of cow sludge manure and pomegranate peel with the lowest cumulative biogas production (i.e., 718 ml/d), the negative impacts of ammonia production might be existed. During the initial treatment period (i.e., second treatment) the low pre-processed pomegranate peels and thus less amount of soluble carbohydrates may lead to slow fermentation and hydrolysis processes of pomegranate peel. Poultry manure, as a surplus source of nitrogen and alternative inoculum material, has high buffering capacity, creates proper pH, and inhibits the VFA activities and the growth of methanogens bacteria in combination with lesions that contain high amount of carbon. Thus, with respect to this reason, an imbalance in effective carbon-to-nitrogen ratio and lack of essential trace nutrients in cow manure sludge may reduce the methanogenic bacteria activity during the stabilization of second treatment. As Vermeullen et al. reported, poultry manure (as a source of nitrogen and adjustment the amount of carbon-to-nitrogen) has more efficiency than other sources of nitrogen, and the low concentrations of nitrogen reduce the biogas production amount. Therefore, many bacteria release their stored nitrogen in these conditions and die. The fourth treatment (0, 34, and 66%) was detected as the optimum treatment after the third treatment due to the high amount of pre-processed pomegranate peel and moderate amount of poultry manure with the 4615 ml/d cumulative biogas as an alternative source of inoculum. The pre-processed pomegranate peels and poultry manure as an alternative inoculum material, even without cow manure, produce can reach to a stable biogas production. The first treatment with a mixing ratio of 60, 13, and 27%, despite having all three materials, had less cumulative biogas production. This is probably due to the presence of large amount of cow sludge manure which had no essential and trace nutrients in this study. [Table 1] shows different proportions of pomegranate peel wastes, poultry manure and cow sludge manure for all investigated treatments. It can be inferred that the third treatment with proper mixing ratio of these lesions has the highest amount of cumulative biogas and proper performance. According to the results of daily and cumulative biogas productions, it can be concluded that the optimum pH for the digestion of the 28, 28, and 44% ratio is in the range of 7–6.47. The lowest pH value belonged to the setting-up period (about 6.47) indicating acidification of the system. During the sixth to the ninth day, the pH remained in the optimal range (6.65–7) for the methanogen bacteria activities. The main problem in the AD of waste products (fruits and vegetables) is the rapid drop in pH and the presence of sugar, hemicellulose, cellulose, and lignin in the organic parts of fruit and vegetable wastes. However, the elements are still able to produce energy, but it is possible that these compounds get unbalanced for a process of AD. Owing to the low pH of these wastes, it might be possible to obtain a high demolition of these fruit and vegetable wastes with simultaneous digestion of other materials and achieve moderate amount of pH values. In this treatment, the AD system had a high performance with utilizing of appropriate mixture of pre-processed pomegranate peel, poultry manure, cow sludge manure and using an alkaline buffer before starting the digestion process even with high amount of pomegranate peel [Table 2]. Biogas production, generally, can be measured from TS (in particularly from VS) of the substrate. One of the useful parameters for evaluating the efficiency of AD is measuring the reduction of VS. Overall, both TS and VS had a downward trend in all four treatments. These findings are consistent with the results of Hongli and Yan regarding to the reduction of VS during the AD process. During the time between the third day to the tenth day, this amount increased to the highest amount of 5.67 and 4.73%. By considering this increase in biogas production during the setting up step and in the first part of the stabilization period, the AD had a good performance and the removal of VS had higher performance as compared to the other days. This often can be related to the facilitated digestion of degradable organic materials in pomegranate peels. It is remarkable that the removal of VS reached to 2.94% in the last 3 days of this treatment, which could attest that this treatment still has good potential for the biogas production. These results agree well with the findings of Ye et al. who studied the removal percentage of VS in their best treatments [Table 2]. The anaerobic fermentation and microbial growth depend on the availability or proper supply of nutrients. In general, the C:N ratio of the mixture of different substrates in AD process affects greatly the biogas production. Analysis of the results presented in [Table 2] shows that the changes of carbon-to-nitrogen ratio during the 15 days of AD in this treatment remained at the optimal value. Therefore, bacteria consume the carbon of pomegranate peels as readily soluble carbohydrates during the installation step (days 1–6) and easily passed the acidic and hydrolysis steps. During the consolidation period (days sixth to twelfth), this ratio is more than the initial value, and it can be said that since a sufficient amount of carbon existed in the environment, the nitrogen amount has decreased in the environment and continued until the last 3 days of the experiment. This factor causes that the balance of the fermentation medium re-establishes with more time. According to Alkanok et al. report, it appears that we can have more efficient performance in AD of fruit and vegetable wastes, fish and animal wastes and active sewage sludge by creating the optimal ratio of carbon-to-nitrogen (30–20). In this study, biogas production from the discontinuous AD using pomegranate peels, cow and poultry manures with four different mixing ratios was evaluated. The AD process was divided into three periods including setting up, stabilization, and suppression. The highest produced biogas value was seen during the suppression process and the first part of the stabilization period in all investigated treatments except the ratio of 0.89, 0, and 0.11 (i.e., the second treatment). Furthermore, the highest cumulative biogas production was obtained in the ratio of 0.27, 0.28, and 0.44 (i.e., the third treatment). Among investigated functional parameters, the carbon-to-nitrogen ratio showed significant differences with other parameters and was in the optimum range. In general, all the treatments had considerable impacts on the biogas production except the second treatment. Thus, the results of this study in a laboratory scale for biogas production appear to be a challenging process so that the substrate composition had a great influence on the performance. In fact, maximizing the biogas performance and improving its quality (high methane content and low hydrogen sulfide) may follow different strategies. Alfa IM, Dahunsi SO, Iorhemen OT, Okafor CC, Ajayi SA. Comparative evaluation of biogas production from poultry droppings, cow dung and lemon grass. Bioresour Technol; 2014;157:270-7. Renewable Energy Organization of Iran (SUNA); 2014. Available from: www.suna.org.ir. Taherdanak M, Zilouei H. Improving biogas production from wheat plant using alkaline pretreatment. Fuel 2014;115:714-9. Chaiprapat S, Laklam T. Enhancing digestion efficiency of POME in anaerobic sequencing batch reactor with ozonation pretreatment and cycle time reduction. Bioresour Technol 2011;102:4061-8. Xiao W, Clarkson W. Acid solubilization of lignin and bioconversion of treated newsprint to methane. Biodegradation 1997;8:61-6. Sitorus B, Sukandar Panjaitan SD. Biogas recovery from anaerobic digestion process of mixed fruit − Vegetable wastes. Energy Procedia 2013;32:176-82. Callaghan FJ, Wase DA, Thayanithy K, Forster CF. Continuous co-digestion of cattle slurry with fruit and vegetable wastes and chicken manure. Biomass Bioenergy 2002;22:71-7. Alvarez R, Lidén G. Low temperature anaerobic digestion of mixtures of llama, cow and sheep manure for improved methane production. Biomass Bioenergy 2009;33:527-33. Risberg K, Sun L, Levén L, Horn SJ, Schnürer A. Biogas production from wheat straw and manure − Impact of pretreatment and process operating parameters. Bioresour Technol 2013;149:232-7. Ye J, Li D, Sun Y, Wang G, Yuan Z, Zhen F et al. Improved biogas production from rice straw by co-digestion with kitchen waste and pig manure. Waste Manag 2013;33:2653-8. Okeh OC, Onwosi CO, Odibo FJ. Biogas production from rice husks generated from various rice mills in Ebonyi State, Nigeria. Renew Energy 2014;62:204-8. Angelidaki I, Ahring BK. Methods for increasing the biogas potential from the recalcitrant organic matter contained in manure. Water Sci Technol 2000;41:189-94. Mladenovska Z, Dabrowski S, Ahring BK. Anaerobic digestion of manure and mixture of manure with lipids: Biogas reactor performance and microbial community analysis. Water Sci Technol 2003;48:271-8. Moller HB, Sommer SG, Ahring BK. Biological degradation and greenhouse gas emissions during pre-storage of liquid animal manure. J Environ Qual 2004;33:27-36. Widodo S. Determination of Volatile Solids, Biogas and Methane Potentials from Municipal Organic Waste and Mixed Materials as Basic for Designing a Biogas Reactor. University College of Boras, School of Engineering; 2008. APHA. Standard Methods for the Examination of Water and Wastewater. 21st ed. Washington, DC: American Public Health Association; 2005. Li J, Wei L, Duan Q, Hu G, Zhang G. Semi-continuous anaerobic co-digestion of dairy manure with three crop residues for biogas production. Bioresour Technol 2014;156:307-13. Le Hyaric R, Chardin C, Benbelkacem H, Bollon J, Bayard R, Escudié R et al. Influence of substrate concentration and moisture content on the specific methanogenic activity of dry mesophilic municipal solid waste digestate spiked with propionate. Bioresour Technol 2011;102:822-7. Liew LN, Shi J, Li Y. Methane production from solid-state anaerobic digestion of lignocellulosic biomass. Biomass Bioenergy 2012;46:125-32. Vermeullen J, Huysmans A, Crespo M, Van Lierde A, De Rycke A, Verstrate W. Processing of biowaste by anaerobic composting to plant growth substrates. Water Sci Technol 1993;27:109-19. Scano EA, Asquer C, Pistis A, Ortu L, Demontis V, Cocco D. Biogas from anaerobic digestion of fruit and vegetable wastes: Experimental results on pilot-scale and preliminary performance evaluation of a full-scale power plant. Energy Convers Manag 2014;77:22-30. Hongli L, Yan W. Influence of total solid and stirring frequency on performance of dry anaerobic digestion treating cattle manure. Appl Mech Mater 2011;79:48-52. Alkanok G, Demirel B, Onay TT. Determination of biogas generation potential as a renewable energy source from supermarket wastes. Waste Manag 2014;34:134-40.